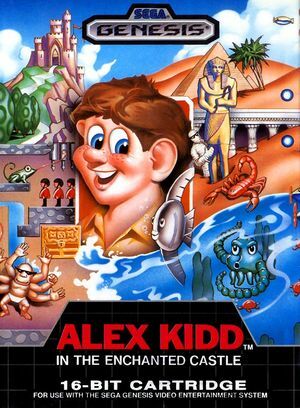 Alex Kidd in the Enchanted Castle follows Alex as he fights his way through the fictional planet Paperock in search of his long-lost father, King Thor. Alex has access to several items and vehicles that help him complete his quest, including a motorbike, pedicopter, and pogo stick, which each give him unique abilities. While traveling through eleven worlds, Alex must defeat several opponents in "Paper, Rock, Scissors" before finally finding King Thor. The graph below charts the compatibility with Alex Kidd in the Enchanted Castle since Dolphin's 2.0 release, listing revisions only where a compatibility change occurred. This page was last edited on 31 December 2017, at 18:22.